The mere name of MS Dhoni brings excitement among the fans, be it in India or anywhere across the world. The former Indian skipper, who during his time as the captain led India to a historic three ICC trophies, is adored and equally respected in the cricketing arena. Whenever he steps foot on the field, the crowd goes berserk and the chants of 'Dhoni, Dhoni' and 'Mahi, Mahi' is a common sight. And on Sunday, during the third T20I between New Zealand and India, a fanboy moment was witnessed on the field. In the first innings, when the Kiwis were batting, a fan holding India's flag stormed into the field and fell in front of Dhoni. 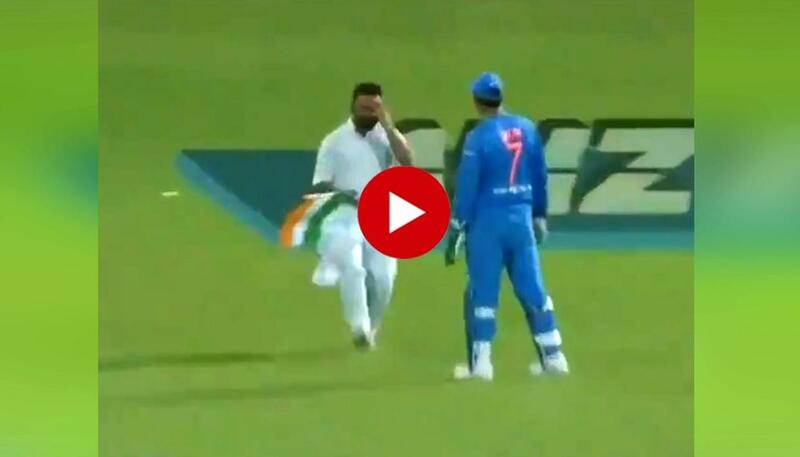 The wicketkeeper-batsman, in a cool and calm manner, took the flag from him and murmured a few words to him, following which the fan sought his blessings before running away from the scene. The incident took place in the middle of a match which India lost by 4 runs, resulting in a 2-1 series defeat and a halting of their incredible recent run in the T20I format. Virender Sehwag terms India's performance against England at Lord's as "very poor"